‘Desire’ is the latest band to break into Colombo’s vibrant music scene. Started about just twelve months ago, the band ‘Desire’ has already managed to get their name on the billboards.The band comprises of five talented musicians with years of experience behind the,Evo Ferdinands, the leader of the outfit and the bands lead guitarist was with popular band ‘Black’ and was a member of ‘Pearl’ till late last year. Krishma Butani is the front line singer of the band. 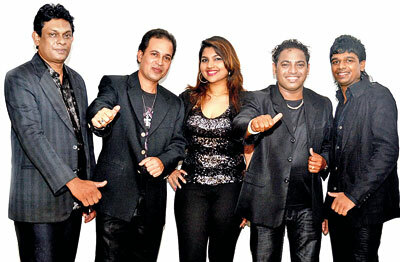 Malaka Perera is the drummer of the band, while Madhawa Weerasinghe handles keyboards. Kasun Kumaraperuma is the bassist of the outfit.Malaka, Karishma and Evo was with the band Pearl , while Madhawawas ithe popular bands ‘Go Public’ and ‘Sam the Man’. ‘Desire’ is a trendy band having new thinking patterns.‘We play any kind of music. Our main motto is ‘play to the audience’. So, we adjust our styles performances according to audience. We are very good ant 60’s, 70’s and 80’s retro music and we play all current hits to new wave music. Hindi songs and baila too are on our repertoire’ explained Evo about the band’s performance style. ‘Meanwhile, we play at weddings, private functions, dances and corporate gigs too’ added Evo.